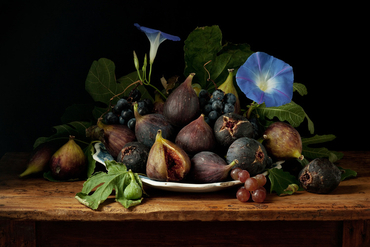 With the eye, or perhaps the soul, of an Old Master, Paulette Tavormina is a rare bird among contemporary artists. 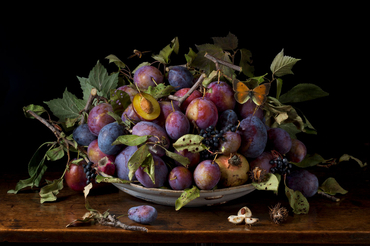 Her glorious still life photographs could hang comfortably alongside 17th- and 18th-century paintings by Dutch, Italian, and Spanish masters—which, in fact, they did recently at the legendary 225-year-old Colnaghi gallery in London. Yet Tavormina's works are modern to their core, crystalline images in saturated colors showing flowers and fruits interspersed with insects, shells, snails, pottery, candles, skulls, books, and other props. They tell stories of love, loss, joy, sorrow, earthly abundance, and beauty. 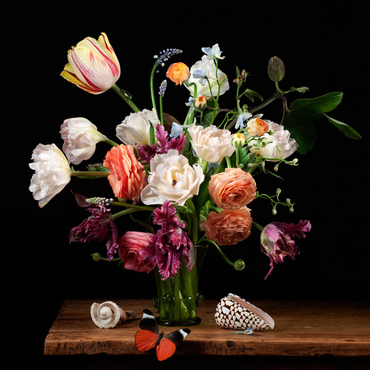 "Old Master paintings are about the metamorphoses of life," says Tavormina, at home in her Manhattan apartment, which doubles as her studio. "For me, it's about relationships. Every component is placed within a relationship to another one—a peony lying its head on a little leaf bed, a leaf propped on the edge of a plate trying to find its balance, two little plums touching each other, apart from the other fruit." Viewers find in her photographs a visceral appeal: They are simply beautiful. But Jorge Coll, chief executive of Colnaghi, has a more definitive answer to what makes Tavormina's work stand out. "It's Paulette's meticulous focus on the structure of each composition," he says. "Where she portrays a bubble, a reflection of light, or a whiff of smoke from a pipe, every single detail, however small, is carefully prepared and composed." Tavormina turned to fine art photography about 10 years ago, after many years of commercial work, such as shooting cover images for magazines and artwork for Sotheby's. She still does some of that—photographing the food in The Del Posto Cookbook by chef Mark Ladner, for example. She also, for a time, foraged for props for movies including Wyatt Earp, The Perfect Storm, and The Astronaut's Wife. And she moved to Sicily for a while, seeking her roots and trying her hand at business. But decades ago her heart had been tugged by Old Master paintings, which she always sought out in museums. Once, a friend showed her a book with images by 17th-century painter Giovanna Garzoni, one of the first female still life painters. She felt an instant connection. When she moved back to New York after Sicily, Tavormina decided to act on that instinct. To make her still lifes, she may sketch, but more often than not she conjures the image she wants. "It's a lot of planning," she says. An admitted hoarder, she composes with objects she has collected over the years, like an oak table she purchased in England, an antique birdcage she found on eBay, a strand of pearls she bought in Sicily, and a set of jailhouse keys she procured for Wyatt Earp. Her apartment is filled—neatly—with these little items, and more things are stashed in storage. The live elements are more difficult. For them, she frequents New York City's pet shops, fruit and vegetable stands, and flower markets. She bought a fig tree to harvest the leaves. A morning glory plant sits on her windowsill. It did not cooperate: She lost a day when its rich blue flowers unfolded at daybreak, and then curled before she was set up. That was nothing compared to the zebra finches she got at a pet store—they flew from their cage. Tavormina had to run out for a net to catch them. She now uses taxidermy birds imported from Australia. Getting the lighting right—what's highlighted, what is in the shadows—is critical for her shoots with a Hasselblad camera. "I take hundreds of pictures to get the one image," she says. Long days on one setup sometimes stretch for a week. It's all part of the pursuit, part of the striving for timeless pieces with 21st-century flair.